One of the best parts of Autumn was walking through the fields gathering Field Mushrooms (the large version of those now called ‘button’) taking them home, pan frying them in loads of butter with just salt and pepper for seasoning and eating with thick slabs of toast for Sunday dinner – bliss! Nothing compares to freshly picked anything. Being close to fields always kept you aware of what each season brings – and what each season brings in produce is usually, in the infinite wisdom of Mother Nature, exactly what your body needs to maintain optimum health, maximum energy and guard against any ailments that may come with weather shifts towards cool edges in breezes. 1teaspoon thyme (optional) – fresh if you have it! Put prepared vegetables potatoes, leeks, celery, carrots, mushrooms, butter, and salt in a pot, and cook over medium heat, stirring until the butter is melted and the vegetables are coated. Add vegetable stock, bring to a boil, cover, and reduce heat to a simmer. Cook until the potatoes are tender (20-30 minutes). When the potatoes are tender, remove from the heat and puree it's contents with the milk. If you prefer a more rustic version, and dopn;t want the milk, simply omit and replace with same of vegetable stock. The potato will naturally thicken the soup. Add thyme, if using, and pepper. Check if you need more salt. Heat soup gently, until just hot, and serve with fresh bread. Preheat fan-forced oven to 200 degrees. Melt butter in large pot and add onion and finely sliced leek, allow to cook until softens then add garlic and sage leaves cook for a further minute. Add half a cup of Vegetable stock to deglaze. Add remaining butter and mushrooms and thyme then cook for a further 5-10 minutes. Add carrots and stock, reduce heat to a medium simmer and allow mixture to cook for 30 minutes, stirring occasionally. Add lentils to mix. Remove pastry from freezer to thaw about 15 minutes prior to baking (10 minutes if using Filo). Mix cornflour with a few tablespoons of cold water and whisk to ensure there are no lumps prior to adding to mix. Stir well and season with salt and pepper. Butter your ramekins and brush rim with a little egg wash.
Divide mixture between 1-cup capacity ovenproof ramekins. Cut out a circle of pastry for each ramekin ensuring that the circle is slightly larger than the rim of your ramekin. Carefully place the pastry on top of the ramekin to create a lid, pinch the edges with your fingers and brush egg wash all over the pastry to secure it. Place ramekins in oven and bake for around 20 – 25 minutes. Remove from oven and serve pot pies warm. You can use your own stuffing for these, that used for poultry (breadcrumbs, salt & pepper, herbs, garlic + stems of mushrooms), to fill large Filed mushrooms. This can be a nice meal, with a side salad, just by itself or serve as a side dish to a larger meal. Mix all ingredients and top your clean mushrooms with them. Bake for 30-45 minutes until parmesan is golden and mushroom cooked. Serve immediately. To the above recipe, doubled, add 500 grams of cleaned chopped spinach. Top with bread crumbs. To the above recipe, doubled, add some finely sliced sun-dried tomatoes and 1 ½ tablespoons of finely diced Kalamatta olives and 1 teaspoon of crushed garlic. Place oil in a frypan, add the onion and 2 to 3 minutes over a moderate heat until onion is soft and golden. Add the chopped tomato and mushroom stalks and cook further 2 minutes. Add oregano, breadcrumbs and lightly beaten egg and mix thoroughly. Spoon mixture into the mushroom caps, sprinkle with parmesan cheese. Place under a griller and grill until golden brown. Illustration: Mushrooms including red-capped mushrooms from the genus Russula [picture] by Ellis Rowan 1848 – 1922 circa 188? Image no: nla.pic-vn4365924; watercolour; 27.9 x 19 cm, courtesy National Library of Australia. Agaricus campestris, photo courtesy Alan Rockefeller. 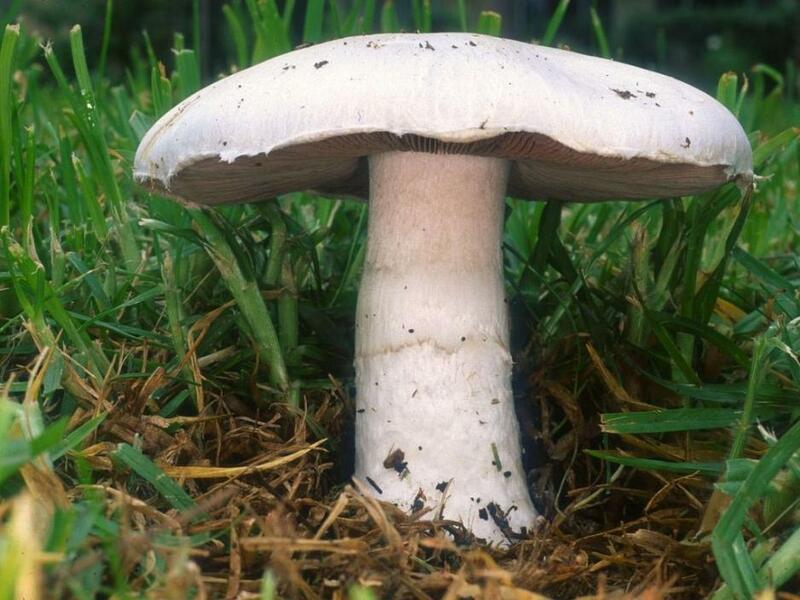 Agaricus campestris is commonly known as the field mushroom. It is a widely eaten gilled mushroom closely related to the cultivated button mushroom Agaricus bisporus. A mushroom (or toadstool) is the fleshy, spore-bearing fruiting body of a fungus, typically produced above ground on soil or on its food source. The standard for the name "mushroom" is the cultivated white button mushroom, Agaricus bisporus; hence the word "mushroom" is most often applied to those fungi (Basidiomycota, Agaricomycetes) that have a stem (stipe), a cap (pileus), and gills (lamellae, sing. lamella) or pores on the underside of the cap. These pores or gills produce microscopicspores that help the fungus spread across the ground or its occupant surface. "Mushroom" describes a variety of gilled fungi, with or without stems, and the term is used even more generally, to describe both the fleshy fruiting bodies of some Ascomycota and the woody or leathery fruiting bodies of some Basidiomycota, depending upon the context of the word. Forms deviating from the standard morphology usually have more specific names, such as "puffball", "stinkhorn", and "morel", and gilled mushrooms themselves are often called "agarics" in reference to their similarity to Agaricus or their placeAgaricales. By extension, the term "mushroom" can also designate the entire fungus when in culture; the thallus (called amycelium) of species forming the fruiting bodies called mushrooms; or the species itself. The terms "mushroom" and "toadstool" go back centuries and were never precisely defined, nor was there consensus on application. The term "toadstool" was often, but not exclusively, applied to poisonous mushrooms or to those that have the classic umbrella-like cap-and-stem form. Between 1400 and 1600 AD, the terms tadstoles, frogstooles, frogge stoles, tadstooles, tode stoles, toodys hatte, paddockstool, puddockstool, paddocstol, toadstoole, and paddockstooles sometimes were used synonymously with mushrom, mushrum, muscheron, mousheroms, mussheron, or musserouns. The word has apparent analogies in Dutch padde(n)stoel (toad-stool/chair, mushroom) and German Krötenschwamm (toad-fungus, alt. word for panther cap). In German folklore and old fairy tales, toads are often depicted sitting on toadstool mushrooms and catching, with their tongues, the flies that are said to be drawn to the Fliegenpilz, a German name for the toadstool, meaning "flies' mushroom". This is how the mushroom got another of its names, Krötenstuhl (a less-used German name for the mushroom), literally translating to "toad-stool". The term "mushroom" and its variations may have been derived from the French word mousseron in reference to moss(mousse). Mushrooms are a low-calorie food eaten cooked, raw or as a garnish to a meal. In a 100 g (3.5 ounce) serving, mushrooms are an excellent source (higher than 20% of the Daily Value, DV) of B vitamins, such as riboflavin, niacin andpantothenic acid, an excellent source of the essential minerals, selenium (37% DV) and copper (25% DV), and a good source (10-19% DV) of phosphorus and potassium. Fat, carbohydrate and calorie content are low, with absence of vitamin C and sodium. There are 27 calories in a typical serving of fresh mushrooms (table). Mushrooms treated with UV light or exposed to sunlight are the only whole food vegetable source of vitamin D.
Copyright Pittwater Online News, 2015. All Rights Reserved.